Alternative data is data that’s different from the credit scores that lenders have traditionally relied on when screening accounts. Those traditional scores, primarily derived from a consumer’s credit history, did a satisfactory job for a long while predicting the creditworthiness of traditional middle-class and upper-class borrowers - consumers who had stable jobs, known addresses, and an ever-growing track record of credit purchases. But today, the limitations of these scores are glaringly obvious. They are missing up to 30% of the market or lack the predictive signals to help lenders make informed decisions. 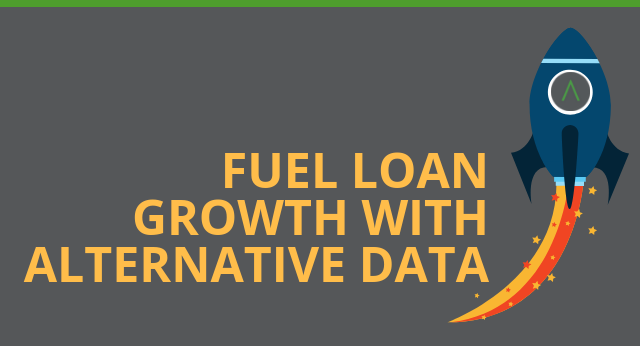 Alternative data addresses these limitations in powerful ways, enabling savvy lenders to meet or exceed their growth goals, even in a tightening credit market. Alternative Data provides data on thin-file and no-file consumers and other consumers that traditional scores miss. Traditional credit scores are fine for evaluating people who have credit and who have used it to make a steady stream of purchases over time. For everyone else - and that everyone is nearly 30% of the U.S. - alternative data is required. Alternative data provides useful data for assessing the creditworthiness of consumers with no credit files (“no-file” consumers) or limited credit files (“thin-file”) consumers. Together, these consumers make up a sizeable and growing part of the U.S. consumer market. And the financial services organizations that find a way to profitably serve these “invisible” consumers can participate in a nearly trillion dollar market that is estimated to have delivered over $180 billion in profits to financial services organizations in 2018. Alternative data provides insights on growing markets such as Millennials and Generation Z (the post-Millennial generation). Milllennials (people born between 1981 and 1997) now make up the largest generation in American society, numbering 75 million people and comprising over a quarter of the U.S. population and two-fifths of the U.S. workforce. Unfortunately, student loan debt and the 2008 Great Recession have reduced their economic resources. Only 15% of Millennials have a mortgage, and 61% have near-prime or worse ratings from traditional credit scores. As a result, lenders who rely on traditional scores will find either negative information or no information at all about most Millennials. And they will find similarly scant information about Generation Z, the next generation now entering college and the workforce. But alternative data, which draws from data sources other than credit histories, can provide the analytical foundation needed for making sound decisions about these consumers, who now make up about a third of the country. With predictive insights about Millennials and Generation Z, lenders can grow their markets and their portfolios, hitting their growth targets and building relationships with new generations of customers. Alternative data, when analyzed with advanced artificial intelligence (AI) techniques, proves to be more predictive than traditional scores. Increase acceptance rates from 54.7% to 74.1%. Maintain or reduce First Payment Default (FPD) rates. Alternative data and AI can be applied to multiple stages of a lending decision data waterfall, fine-tuning whichever stage requires further optimization. A data waterfall is the sequence of analytical steps involved in a loan decision. Alternative data can be complimentary to existing scores, swapped out, or leveraged by analytical models and tuned for specific stages of the waterfall to make a yes/no decision at each. For example, lenders can apply predictive analytics by leveraging AI and alternative to re-evaluate rejected applicants for overlooked signs of creditworthiness and say “yes” to more profitable accounts. When a lease-to-own company re-evaluated rejected accounts using a combination of alternative data and AI, it found it could say “yes” to 17% of the accounts it had been rejecting. The company was able to grow revenue simply by re-evaluating prospects it had previously rejected, without wasting expensive leads. Alternative data is transforming the lending industry by enabling businesses to achieve their growth goals by serving tens of millions of consumers who are invisible or misrepresented by traditional credit scores. Lenders interested in growing accounts and hitting their 2019 growth goals should incorporate alternative data and AI techniques into their loan-decisioning models as quickly as possible. Alternative data will be the focus of a special panel discussion at the upcoming 2019 KNOW Conference in Las Vegas from March 24 to March 27, 2019. "With as many as 62 million Americans excluded from traditional credit scoring, alternative data sets are being leveraged to bring 'thin-file' consumers into the financial system. Learn how artificial intelligence and other technologies are being combined with innovative new data sources to expand service provider reach while promoting financial inclusion". For more information about the KNOW Conference, visit the conference website. To learn how AI Lift, our new Credit Risk Web Service, can leverage AI techniques and alternative data to help lenders grow profitable accounts, click the button below and download our solution brief.